It’s easy to see why the fall is our favorite season along the Maine coast. Although the calendar may say otherwise, autumn begins just after Labor Day, when the evenings turn cooler and the foliage begins to take on characteristic red and orange tones. In early September, the Atlantic’s waters reach their warmest temperatures and, under the warm midday sun, are ideal for exploring and recreation! As the temperatures dip, the leaves begin to change color, reaching their most vibrant by mid-September through mid-to-late October. The Maine coast is famous for these fiery hues and there are plenty of activities to take advantage of this stunning scene. One of the best ways to enjoy the sights and sounds of autumn are on the many trails that meander through the southern Maine coast. Many enjoy strolling through the tree-lined streets of historic Kennebunkport during this time of year or extending their walks along Ocean Avenue out to the open Atlantic Ocean. For more secluded options that truly surround you with the fall foliage, consider visiting the Wells Reserve at Laudholm Farm. Located less than five miles from the Maine Stay, you’ll find seven miles of trails that stretch from a protected beach to pastoral fields and peaceful estuaries to deep woods. When visiting Kennebunkport, you’ll never run out of picturesque areas to explore. There are miles of trails in protected parcels throughout the Kennebunks, thanks to the Kennebunkport Conservation Trust and the Kennebunk Land Trust. Fall is the perfect time to enjoy poking through vintage treasures or even trinkets all along the Southern Maine Antique Trail. 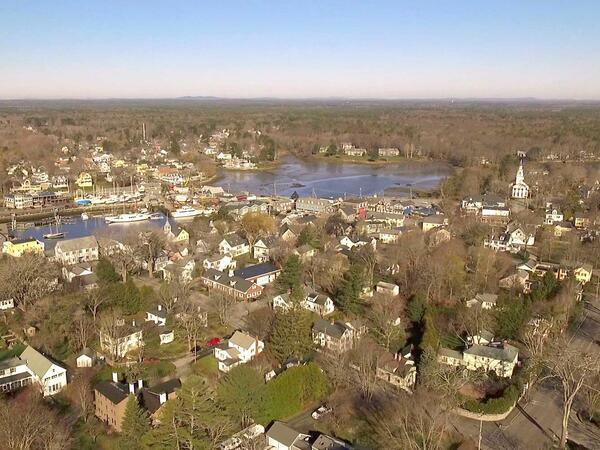 Kennebunkport is situated right in the very middle, meaning that there are phenomenal antique shops all around us. The signature boutiques and galleries of Dock Square are surrounded by picturesque inlets and peaceful marinas. Nearby villages on the Maine coast also offer unique shopping opportunities while the larger outlets centers of Kittery and Freeport (home to L.L. Bean) are just a short drive from Kennebunkport. The 57 active lighthouses on the coast are some of Maine’s most iconic images and there are many within an easy drive of the Kennebunkport. One of Maine’s most photographed lighthouses, York’s Nubble Light, is ideal for a picnic or a quick day trip. And it’s just a few miles from Kennebunkport. Slightly to our north, you’ll find the Cape Elizabeth Lights, the Portland Breakwater Light and Portland Head Light – the state’s oldest, complete with stunning grounds and a museum to enjoy. But you can experience the sight of one of these iconic structures without ever leaving Kennebunkport. The recently restored Goat Island Light House sits just off the coast of Cape Porpoise. Kennebunkport is known for its culinary scene throughout the year and fall is no exception. At this time of year, however, we highly recommend restaurants where you can enjoy the colors of the fall foliage. Pier 77 Restaurant and the Ramp offer casual and more elegant dining options overlooking Cape Porpoise Harbor and Goat Island Lighthouse. In addition, the Arundel Wharf Restaurant has beautiful views of the Kennebunk River and a stunning stretch of undisturbed land. The wraparound front porch and lovingly maintained gardens are the ideal spot to enjoy an afternoon cup of tea and a freshly baked cookie while watching the changing scenery of Kennebunkport’s Historic District.